Thermo Fisher Scientific has secured 510(k) clearance from the US Food and Drug Administration (FDA) and CE mark for a new immunoassay to detect buprenorphine and three major metabolites. It is a no-wash (homogeneous) immunoassay, which specifically detects buprenorphine and its three major metabolites such as as buprenorphine-β-D-glucuronide, norbuprenorphine, and norbuprenorphine-β-D-glucuronide. With the support of Cedia technology, the assay can run in both qualitative and semi-quantitative modes. Cedia Buprenorphine II assay is said to have no significant cross-reactivity to other opioids such as morphine, making it suitable to test the urine samples from patients on slow-release oral morphine (SROM) therapy (trade name Substitol). According to Thermo Fisher, buprenorphine is considered as a more effective alternative to methadone in the treatment of opioid addiction and can be prescribed on an outpatient basis rather than in methadone clinics. The assay holds capacity to accurately differentiate buprenorphine treatment samples from SROM treatment samples. Thermo Fisher Scientific clinical diagnostics general manager and vice president John Kody said: "The Cedia Buprenorphine II Assay is the only assay on the market that detects all three major metabolites. "The ability to detect each of these metabolites is important because it minimizes the potential for false-negative results." Thermo Fisher has also introduced new Cascadion SM clinical analyzer, designed to effectively use for the selectivity and sensitivity of liquid chromatography-tandem mass spectrometry (LC-MS/MS). The fully automated analyzer has been developed for use in different settings such as hospital laboratories and offer results for a range of clinical tests. 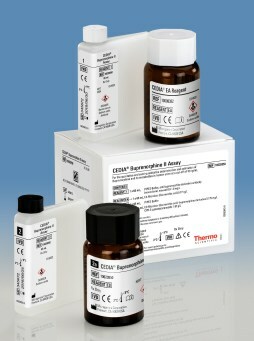 Image: Thermo Fisher’s Cedia Buprenorphine II assay can be used to detect buprenorphine and its three major metabolites. Photo: courtesy of Thermo Fisher Scientific Inc.